Expert scone chef Richard Hunt of the Devon Scone company has more than 20 years’ experience in the industry and has even shared his scone recipes with Kirstie Allsopp for her Channel 4 TV programme. He regularly holds talks at food festivals explaining how to make great scones the Devon way and this is what he had to say. 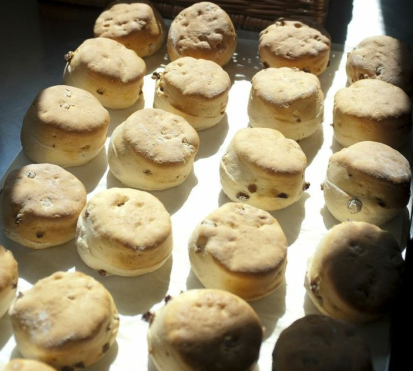 Richard’s makes scones that are a cross between traditional Devon splits and the standard scone. This means his scones don’t crumble apart, instead you can actually rip Richards’s Devon scones into two parts by hand and that how traditional Devon scones should be. In order to achieve a good scone structure Richard doesn’t use eggs, instead his main ingredients are butter, milk, a strong flour and natural yogurt. The acid in the natural yogurt actually helps the baking powder to work, which results in a great rise. The rise achieved by Richard actually makes it possible to cut his scones into three pieces, which is a great method to increase for cream and jam intake! It’s also important to keep the pastry thick when its rolled it out, around an inch and a half in thickness is ideal. Richard sprays his scones with non-egg glaze made using vegetable oil and natural food colourings in order to give his scones a nice colour but glazing scones with a beaten egg works well for home-baking. Fruit scones are made in the same way that plain scones are but the important thing to do when baking fruit scones is to use high quality sultanas. This is because cheap sultanas will go dry when the scones are cooked and then break during eating. Richard hasn’t revealed his exact recipe but here’s a simple version of it. This recipe doesn’t use natural yogurt but does use strong flour and avoids using eggs in the mixture in order to achieve a good texture that does crumble easily. ← How many calories in a Cream Tea? How many calories in a Cream Tea?